No. Although they have superhuman, intelligence and strength, it is not unlimited. They can do only what God allows and commands. But about that day or hour no one knows, not even the angels in heaven, nor the Son, but only the Father (Matthew 24:36). The demons also are under the same restrictions as revealed to us in the account of the Demon Possessed Man. He shouted at the top of his voice, What do you want with me, Jesus, Son of the Most High God? In God’s name don’t torture me! For Jesus had said to him, Come out of this man, you impure spirit! Then Jesus asked him, What is your name? My name is Legion, he replied, for we are many. And he [the Demon] begged Jesus again and again not to send them out of the area. A large herd of pigs was feeding on the nearby hillside. The demons begged Jesus, Send us among the pigs; allow us to go into them. 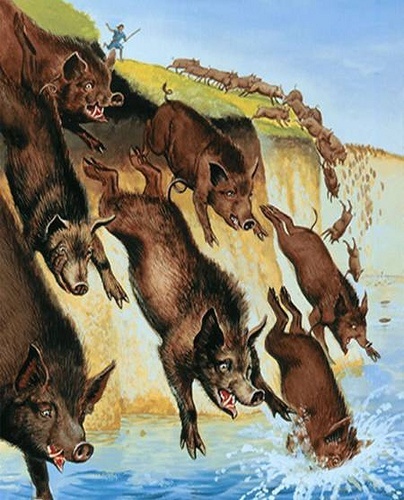 He [Jesus] gave them permission, and the impure spirits came out and went into the pigs (Mark 5: 7-13a).